Ace Parkway- The Property You Should Live In Ace group has come up with the premium layout of Ace Parkway nestled at the prime and strategic location of Noida expressway sector 150. Providing proximal connectivity to nearby location and social centers it is one of the best residential options. The layout consists of 970 eco-friendly flats having 2,3,4 BHK apartments. Spread across an area of 12 acres, it allows 1085 sq. ft. to 3220 sq ft to individual apartment. These flats are constructed using modern art-deco theme and are brimmed with all modern amenities to bring pleasure to life. The project being a strategic built reveals natureâ&#x20AC;&#x2122;s bounty from all corners and encompasses lush green area all around. Moreover it features best of the amenities in the surroundings which includes entry plaza with landscape feature, club entry paved plaza, amphitheater, celebration lawn, fitness area, reflexology park, etc. for sports freak it has swimming pool, palm court, basketball court, badminton court, cricket pitch, tennis court and lots more. Specially designed to render an ultimate comfort to life in the least polluted surrounding, this project is a perfect property investment within an affordable price range. The project models top-notch interiors and other internal facilities including all kind of visible and latent fitting, wooden work, flooring, spacious rooms, fire preventives and hence is one of the safest construction. Apartments are decked with all the facilities of living, drawing, dining rooms, kitchen toilets, balcony etc. to withstand all the expectations of the buyers. The built consist of gymnasium, intercom facility, elevator, maintenance staff, power backups, security water storage and other such requirement. The project is supposed to be completed by 2021, the approaching year, so yes it is one of the idealist property to let your progeny grow. The safe, clean and pure environs add grace to it, so books yours now, or it can also be used as best rental propert. 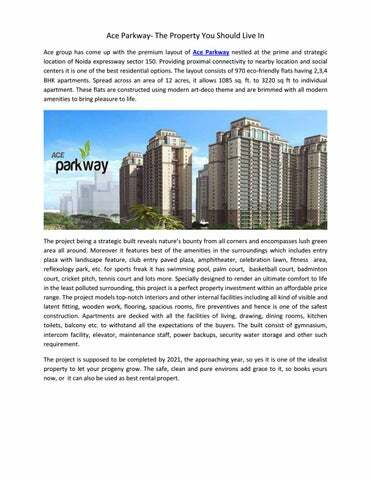 Ace Parkway- The Property You Should Live In.